LOS ANGELES -- Japan successfully launched a robotic spaceship Saturday with supplies to stock the International Space Station with scientific gear, spare parts and provisions for the lab's six-person crew. The 35,000-pound orbital freighter blasted off aboard an H-2B rocket at 0537:57 GMT (12:37:57 a.m. EST) from Launch Pad No. 2 at the Tanegashima Space Center, an island base at the southern tip of Japan. The 186-foot-tall rocket soared into a mostly clear sky, breaking the sound barrier about a minute after setting off from its seaside launch pad. Four solid rocket boosters jettisoned two minutes into the flight, and the launcher's twin first stage main engines cut off less than four minutes later. A hydrogen-fueled second stage placed the H-2 Transfer Vehicle in orbit and deployed the payload 15 minutes after leaving Earth. The rocket was aiming for an orbit between 124 miles and 186 miles high with an inclination angle of 51.6 degrees to the equator. The rocket's actual orbital parameters were not immediately available, but a NASA spokesperson reported the launch was successful and said the HTV was transmitting data back to Japanese engineers in Tsukuba, a scientific hub just outside of Tokyo. "The launch vehicle flew smoothly, and, at about 15 minutes and 13 seconds after liftoff, the separation of the Kounotori 2 was confirmed," the Japan Aerospace Exploration Agency said in a written statement. Japan is calling the spacecraft Kounotori 2, which means white stork. JAXA confirmed the craft was controlling its orientation in space and activating key systems in the moments after reaching orbit. The launch was delayed two days by bad weather earlier this week. 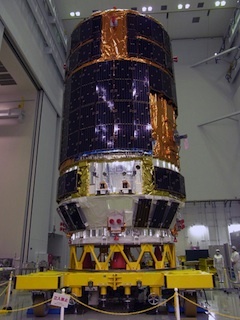 Saturday's mission is the second time Japan has launched the H-2B rocket and HTV cargo ship. 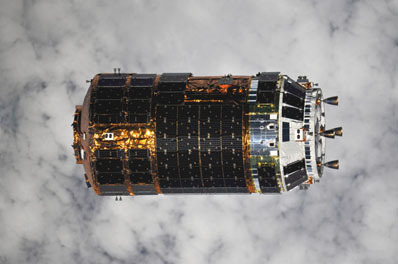 JAXA and Mitsubishi Heavy Industries developed both vehicles as part of their contribution to the space station program. NASA reserves room on HTV missions for U.S. equipment as part of a barter agreement in return for the space shuttle's launch of Japan's Kibo module, the station's largest laboratory. The U.S. space agency provided 4,840 pounds of cargo for the HTV flight, including nearly 2,000 pounds of unpressurized gear comprising two large spare units mounted on the craft's exposed module. Stretching 33 feet long and 14 feet wide, the unmanned cargo vessel is carrying more equipment on this flight than on its first mission in 2009. Its total cargo load amounts to nearly 8,500 pounds, according to NASA. The debut HTV flight had extra batteries and propellant for several key demonstrations before approaching the space station. Those have been removed from this mission. Japanese engineers optimized the interior of the spacecraft, relocating ventilation ducts and lights to free up space for more cargo. Another change allowed the HTV to carry more bags of small internal logistics items, according to JAXA. Designers also modified navigation and rendezvous software used in the HTV's flight in space. The HTV features 57 solar panels arranged on the exterior of the ship for power production. The forward end of the craft is called the pressurized logistics carrier and the mid-section contains unpressurized cargo. The back end of the HTV is the service module housing avionics and propulsion systems. Japan is building five more HTVs for launch about once per year through about 2016. The next flight is expected in early 2012. Kounotori 2 will fire engines early Saturday to raise its orbit and set a course to approach the International Space Station. A further series of maneuvers over the next four days will set the stage for the ship's arrival at the complex early Thursday. Four main engines and 28 maneuvering thrusters will fine-tune the HTV's rendezvous with the station. The jets are wired to two redundant control strings. The engine burns will place the HTV in position for its laser-guided navigation system to guide the ship to a capture point about 30 feet directly beneath the outpost's Kibo module. Astronauts Cady Coleman and Paolo Nespoli will grapple the barrel-shaped spacecraft with the lab's robot arm and attach the ship to the Earth-facing port of the Harmony module. Plans call for the HTV to be robotically captured at 1144 GMT (6:44 a.m. EST) Thursday. It should be firmly bolted to the station a few hours later. In early February, the station crew will transfer two NASA payloads from the craft's external cargo hold. One unit is a box with electrical circuit breakers and video equipment, and another is a spare flex hose rotary coupler, a crucial component in the space station's cooling system. The outpost's Canadian and Japanese robot arms will pull a cargo pallet from the HTV and place it on the porch of the Kibo lab module. Dextre, a two-armed human-like robot, will move the payloads from the HTV pallet to the space station. Not all of the action will be going on outside the complex. Astronauts inside the station will also be unloading food, water, computers and tons of spare parts from the HTV's pressurized cabin. Eight refrigerator-sized racks are inside the HTV. Two of the racks are Japanese science payloads that will go inside the Kibo module. The others are resupply racks containing a variety of equipment and supplies. Once all the cargo is removed, the crew will place trash inside the craft for disposal. The transfer work will be interrupted in late February, when the astronauts will relocate the HTV from the bottom port to the upper position on Harmony. The temporary move is scheduled for around Feb. 18, clearing room for the shuttle Discovery's visit to the complex in late February and early March. The freighter will be returned to the Earth-facing port around March 8. The ship is scheduled to leave the station March 28 and plunge back into the atmosphere the next day, destroying the spacecraft and getting rid of the station's waste in a fireball over the Pacific Ocean. The first half of 2011 is a busy time for the space station. At least two space shuttle visits are planned, plus Japan's HTV and Europe's Automated Transfer Vehicle will deliver supplies to the outpost. Soyuz capsules will come and go with crews and Progress spacecraft ferry cargo for the Russian segment of the station. The next Progress freighter is scheduled to launch Jan. 27. The European Space Agency plans to dispatch the ATV to the station Feb. 15. Late February and early March will be the only time in the station's history that all of its existing piloted and unpiloted visiting vehicles will be present at the orbiting lab. If schedules hold, the shuttle Discovery, HTV, ATV, Soyuz and Progress spacecraft should be docked to the complex at the same time.